While Cassini keeps flying by this moon of Saturn collecting new amazing data, one can say that the data collected by Huygens's six instruments during its 2.5-hour descent and touch-down have provided the most spectacular view of this world yet and first dramatic change in the way we now think about it. "When you put all the data together, we get a very rich picture of Titan," says Ath�na Coustenis, Observatoire de Paris, France, "The Descent Imager/Spectral Radiometer (DISR) pictures were an enormous surprise. We had expected a much smoother landscape." Instead, they saw a varied landscape of channels that had been formed by some kind of flowing liquid. Daniel Gautier, Observatoire de Paris, France, thinks that the other isotope, Ar36, is telling scientists that Titan formed after Saturn, at a time when the primeval gas cloud that became the Solar System had cooled to about 40 deg K (-233 deg C). The atmosphere of Titan held surprises too. 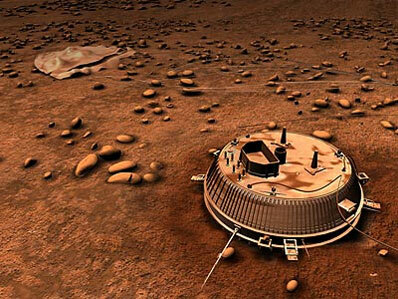 "Huygens made a fantastic and unexpected discovery about the wind," says Gautier. At an altitude of around 60 kilometres, the wind speed dropped, essentially to zero. Explaining this behaviour presents a challenge for theoreticians who are developing computer models of the moon's atmospheric circulation. The Huygens Atmosphere Structure Instrument (HASI) provided the temperature of the atmosphere from 1600 kilometres altitude down to the surface. "This has helped put all the other data into context," says Coustenis. Huygens measured the composition profile of the atmosphere to be a mixture of nitrogen, methane and ethane. The methane and ethane provide humidity, as water does in Earth's atmosphere. At the surface of Titan, Huygens measured the temperature to be 94 deg K (-179 deg C) with a humidity of 45 percent. Even though the Huygens data set is now two years old, the discoveries have not yet stopped. "There are lots of surprises still to come from this data," says Francesca Ferri, Universita degli Studi di Padova. In addition, Huygens gives planetary scientists a wealth of 'ground-truth' to complement and help interpret the observations still coming from Cassini. At the beginning of 2007, Cassini showed that liquid methane is present on Titan in lakes. Cassini, whose experiments also see a joint US and European participation, will make another 22 fly-bys of Titan - the first on 13 January - between now and the end of its scheduled mission in the summer of 2008. The Cassini-Huygens scientists are discussing their options to extend the mission. One idea, says Christophe Sotin, Universit� de Nantes, France, would be to use Cassini to study the newly discovered lakes.